What happens behind the scenes? Learn about what goes into ingredient selection, menu development and meet the team that prepares your meal! 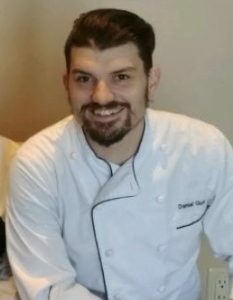 Born in London Ontario, Daniel Guerra grew up in Piacenza, Italy, working in the kitchen since he was 12 years old. He studied culinary arts and restaurant management in Salsomaggiore Terme in northern Italy and has worked across Ontario and in Italy. At 30 years old, he brings 18 years of experience to Verdicchio Ristorante | Enoteca. The quality of the ingredients and where they are sourced are important to me. How animals are raised and their environment is essential to know and will decide how I will prepare the dishes. Whether it is meat, vegetables, pasta or seafood, I want the natural flavours to shine. Is sourcing food locally important to you? Absolutely, because I am able to connect with the farmers and producers on a personal level to learn more about their products. When I worked in Ottawa, I had a good relationship with a farmer who would grow produce specifically for the restaurant. I will be looking to do more of this in Sudbury. How does the blind tasting menu fit into this equation? We came up with the blind tasting to showcase unique ingredients and invite our customers to taste dishes they wouldn’t otherwise select. It’s a new culinary experience for them and we have been receiving a lot of positive feedback. That’s why we are making it a new part of our menu. What can someone expect when they order the blind tasting menu? You can expect to try new flavours and reimagine familiar flavours in a different way. Not only do our customers get to experience something new, but my kitchen team gets to build on their culinary skills and have fun too. Describe your kitchen team in five words. Young. Positive. Ambitious. Skilled. Passionate.